Welcome to HGFortune Synthesizer & Synthesonics ! ﻿﻿Important Notice - August, 08. 2014 - Please read: Due to some unforseeable circumstances I've to go to a different place for about 10 to 14 days. The drawback is it is a fairly remote place and I'll have only scarce access to internet. As I don't have a smartphone I won't be able to read and answer to emails thus I took the shop page offline as a reply to purchase mails within 24 hours will not be possible. If my stay at that place has to be extended for some reasons you'll be updated by my trusted friend Armin Küster. 128 Patches providing fresh inspirations for your creativity! With the extended waveset we have also added to several patches "Morphing Between" and "Blending In" of waves via ModWheel or Aftertouch. This gives you powerful means and more expressiveness for amazing sonic motion and wide live sound variations at your fingertips. Soundset "Space Electronics" is suited for all genres of electronica. The HGF-Blofeld-Waveset-01 has been extended to HGF-Blofeld-Waveset-A-128 with 128 waves. The additions are of the Cpl and Scp type i.e. complex and scapes waveforms. As the new waves have simply been added all prior soundsets for HGF-Blofeld-Waveset-01 are still fully functional. Requirements: Blofeld keyboard or desktop module with SL license, and waveset: HGF-Blofeld-Waveset-A-128.wpc supplied with the soundset. Astral Dreamer on new ways of the special sound of HGFortune synthesizers! Get a free 3 CD Set Astral Dreamer Hyper Experience - One Night From Eternity 2013! This piece is more-or-less a one synth challenge except for the drums all I used to compose this piece was the HG Fortune Astral Dreamer. I'm adding in the patch data into the comments if anyone is interested in how it was put together. I am a big fan of HG's synths www.hgf-synthesizer.com/ mostly because I'm a huge sci-fi fan and these patches just make it so inviting to do tracks like this. For this track I went after a feel that was very cinematic yet remained very electronic (as Daft Punk did with Tron) of course being a huge "Mass Effect" fan it has a Jack Wall influence, thus how I decided on a title...so I suppose that makes this fan art ? As for the drums, they were done with a classic Reaktor patch called Newscool that I have adored for years, a few epic drum hits for drama as well as a basic kick\snare\HH from my old friend Battery 3. 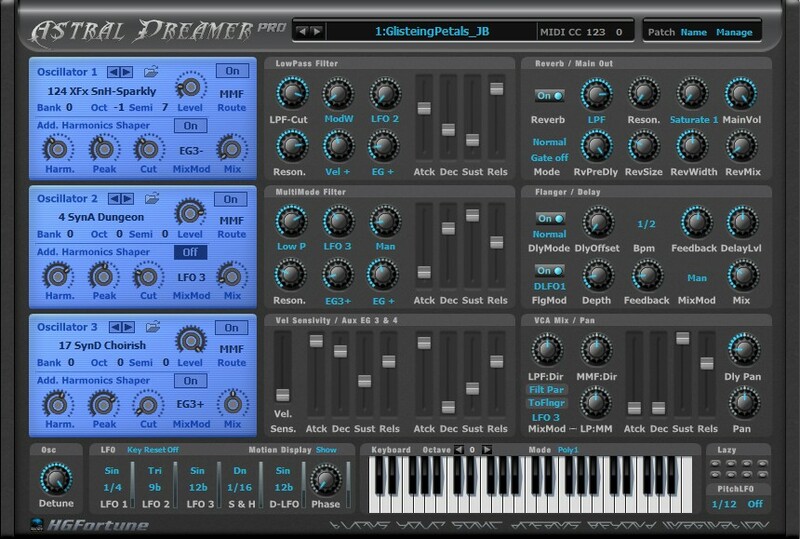 Serenity Pro, UltraSwamp Pro, Avatar ST Pro, The Dreammachine 3 Pro and Ghost Machine Suite Pro have been removed and are no longer available. Don't expect the Pro versions of these plugins to be added to the NFG items. You still might have fun with the free/basic versions which can be downloaded from this page. If You are looking for special VSTi synthesizers with a different and complex sound but straight easy editing this is the place for You to look! Customer Steve Mahkonen wrote on facebook: I'm old enough to remember using things like the VCS3, Synthi A, Polyfusion, Moogs and Arps. I remember how they were and the amount of crap written by people who had never used them live. The H.G.Fortune synths re-create the sense of investigation and magic that the early synths but without the cost, exclusivity reliability problems. "I just came home from a Hollywood recording project today and tried out The Tiger, absolutely incredible! You have really taken it to another level with this one; the interface is great and the sounds are just stunning. I haven't been able to stop messing around with this since I fired it up hours ago. ... I will most certainly be using this one on upcoming tracks!" Ranjarresh wrote on kvr: I have most of HG Fortune's synths and I think they are unique. They have warm, organic and spatial sound, which distinguishes them between other VSTi synths, often sounding like electronic door bells. Moreover, absolutly fantastic "Lazy" buttons giving possibility to not only create, but also to discover. In my opinion humans are limited in their decisions and choices, which applies also to area of artistic creativity. This is why psychologist can actually "read" a person from her/his drawing. "Lazy" buttons makes available for us creation by choice, not by pure constructing labor. We are able to use sounds, which we "recognize", when we hear them, but which were not constructed by us. No, this is not lazyness, this is "unconsciousness creativity sonar". In this context, HGF's algorithmic machines (DreamMachine, GhostMachine, Spaces Wizard) are just perfect examples of such unbiased, unleashed yet structurized and koherent creation (BTW: I love idea of spoken quotes as "OneShot" sequences. These quotes work simply powerful out of their initial context - excellent food for imagination! - Just try DreamMachine3 and Patch 87 "Ready for the movie"). Another thing: perfectly crafted SF2 soundbanks. They are very good matched with their host instruments. And sounds in these banks are not only samples from some synthetic sources - they contain "organic" sound materials, including sonifications of various graphic materials (photos, drawings, etc). Playing with images sonifications myself I know that such sources create unique sounds. Aesthetics and ergonomics: HGF's synths *look* good, and have clear interface. The philosophy of all options in reach of hand (no tabs, no infinitely scrolling/expanding menus) is optimal, IMO. Prices are more than fair. I saw many "two oscillators crossed with two filters" type synths, being sold for few dozens of $. Such "instruments" could be at best modules in complex HGF's synths. His synthesizers are THE Sound Machines, not simple music-boxes. And they are worth their price. And HGF himself is creative. I read someone on this forum called him "Bob Moog of VSTi". This is right. New instruments, new ideas, new sounds, new creative opportunities. All served in clear interface. HG Fortune's basic philosphy on creating synthesizers is to keep all GUI i.e. control elements on one screen for best overview and ease of use. So one does not notice the internal complexity under the hood to achieve some very special sound with optimized control.